Color:Lemon & Vitamin B Mask Color:Lemon & Vitamin B Mask There’s really no better feeling than when your skin feels clean and fresh. At O Naturals we decided to take one of nature’s finest cleaners and create something to give your facial skin the ultimate cleansing. 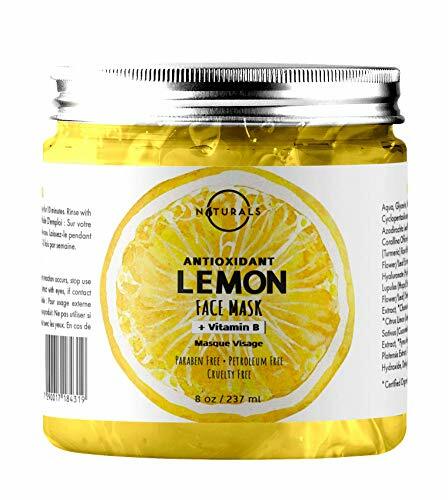 O Naturals Antioxidant Lemon & Vitamin B Gel Face Mask was designed to purify your skin, leaving it smooth and truly clean. Lemon Peel Oil is one if nature’s best cleaners. It effectively eliminates dirt and other impurities from the skin with its antibacterial and antiseptic properties. These antiseptic and antibacterial properties also make Lemon Peel Oil outstanding at combatting acne. These properties work in conjunction with pore tightening components that control oil production in order to keep acne from forming in the first place. Lemon Peel Oil works in this formula with Corallina seaweed extract to hydrate and moisturize the skin. The Corallina seaweed extract moisturizes and penetrates the deeper layers of the skin while the Lemon Peel Oil hydrates it simultaneously. Vitamin B smoothens the skin. It does so by reducing oil formation at the skins surface. Meanwhile, other Vitamin B components form a barrier to maintain the skin’s moisture. This leaves you with soft and smooth skin. O Naturals added Apple and Neem extracts to this mask to enhance its effectiveness. Apple Extract supports the Vitamin B by using its polyphenols and catechins to lock in moisture and nourish your skin. It is also extremely cleansing, supporting the Lemon Peel Oil. Neem Extract was added for its high amount of Vitamin C which encourages collagen production, creating new, softer skin. It is also an outstanding antioxidant, protecting the skin from free-radicals. Get deeply cleansed, rejuvenated skin today with O Naturals Antioxidant Lemon & Vitamin B Gel Face Mask. Try it today and your skin will thank you tomorrow.